Homology Mouse - identical; guinea pig -17/18 amino acid residues identical; human, rabbit - 16/18 amino acid residues identical. 1. Guinea pig Anti-CaV1.2 (CACNA1C) Antibody (#AGP-001), (1:200). 2. Guinea pig Anti-CaV1.2 (CACNA1C) Antibody, preincubated with the control peptide antigen. 1. Guinea pig Anti-CaV1.2 (CACNA1C) Antibody (#AGP-001), (1:200) in CaV1.2 (CACNA1C) Channel Overexpressed Membrane Fractions (LX-104). 2. Guinea pig Anti-CaV1.2 (CACNA1C) Antibody in non-transfected oocytes. Immunohistochemical staining of human left atrium using Guinea pig Anti-CaV1.2 (CACNA1C) Antibody (#AGP-001), (1:100). The picture was kindly provided by Dr. Van Wagoner, D.R. from the Department of Molecular Cardiology, Cleveland Clinic, Cleveland, Ohio, USA. Lovano, B. and Peterson, J. collected the data. Immunohistochemical staining of rat heart paraffin embedded sections using Guinea pig Anti-CaV1.2 (CACNA1C) Antibody (#AGP-001). 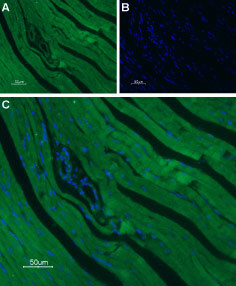 A. CaV1.2 staining (green) appears mainly in the cardiac muscle, and in a lesser intensity in the tunica intima layer of the smooth muscle of the muscular arteries. B. Nuclear staining using DAPI as the counter stain. C. Merged images of A and B.
Immunohistochemical staining of mouse dentate gyrus using Guinea pig Anti-CaV1.2 (CACNA1C) Antibody (#AGP-001). 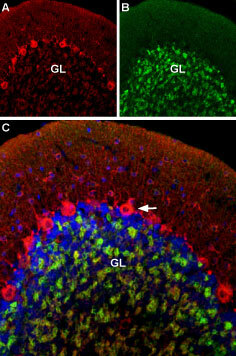 A. CaV1.2 (green) appeared in the outer molecular layer of the dentate gyrus and in the granule layer. 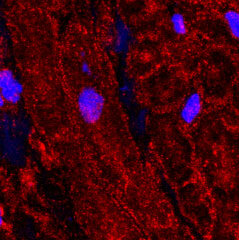 B. Counterstain with DAPI (blue) outlines the granule layer of the dentate gyrus. Bauer, C.S. et al. (2010) Curr. Opin. Neurobiol. 20, 563. Davies, A. et al. (2007) Trends Pharmacol. Sci. 28, 220. Dai, S. et al. (2009) Physiol. Rev. 89, 411. Zuccotti, A. et al. (2011) Trends Pharmacol. Sci. 32, 366. Hell, J.W. et al. (1996) Proc. Natl. Acad. Sci. U.S.A. 93, 3362. De Jongh, K.S. et al. (1996) Biochemistry 35, 10392. Gao, T. et al. (2001) J. Biol. Chem. 276, 21089. Liao, P. et al. (2010) Pflugers. Arch. 460, 353. Voltage-gated Ca2+ channels (CaV), enable the passage of Ca2+ ions in a voltage dependent manner. These heteromeric entities are formed in part by the pore-forming α1 subunit which determines the biophysical and pharmacological properties of the channel1. L-type Ca2+ channels make up one of three voltage-gated Ca2+ channel families. Four different α1 isoforms (CaV1.1 to CaV1.4) belong to the L-type subfamily. Structurally, each α1 subunit has four homologous domains (I-IV) and each domain has a six transmembrane section. Like many other voltage-gated channels, L-type Ca2+ channels have auxiliary subunits which are responsible for modulating the surface expression and properties of the channels2-5. CaV1.1 is mostly expressed in the skeletal muscle, while CaV1.4 is mainly detected in the retina. The expression of both CaV1.2 and CaV1.3 is more extensive and includes neurons, heart, smooth muscle, inner ear, retina and pancreas6. L-type Ca2+ channels are involved in and modulate a variety of physiological functions such as muscle contraction, hormone secretion, neuronal excitability and gene expression5. CaV1.2 undergoes various post-translational modifications. For example, it can undergo proteolytic cleavage at its C-terminal. This cleavage has been shown to take place in neurons following the activation of NMDA receptors5,7 and in the heart5,8,9. The cleaved moiety can still interact with the channel and its general purpose is to modulate channel activity5. Other postranslation modifications of the channel include phosphorylation of CaV1.2 by a number of kinases such as PKA, PKC, Src and CaMKII5. In addition, it is not surprising that phosphatases also regulate channel activity, as they are required to antagonize the activity of the various kinases known to phosphorylate CaV1.2 5. The fact that CaV1.2 plays a prominent role in proper cardiac function has prompted endless studies regarding its regulation. Such studies have concluded that dysregulation of the channel leads to anomalies in heart contraction and thus heart failure5. Likewise, CaV1.2 defects have been detected in autism and bipolar disorder10. Immuno-colocalization of CaV1.2 and GABA(A) α1 Receptor in rat and mouse hippocampusImmunohistochemical staining of mouse and rat hippocampal dentate gyrus using Guinea pig Anti-CaV1.2 (CACNA1C) Antibody (#AGP-001) and Anti-GABA(A) α1 Receptor (extracellular)-ATTO-488 Antibody (#AGA-001-AG) in the same section. Both CaV1.2 (red) and GABA(A) α1 Receptor (green) are detected in neuron-shaped cells (arrows). Staining suggests partial colocalization between CaV1.2 and GABA(A) α1 Receptor in a sub-population of dentate gyrus neurons. A. Mouse hippocampus. B. Rat hippocampus. Guinea pig Anti-CaV1.2 (CACNA1C) Antibody (#AGP-001), raised in guinea pigs, is a highly specific antibody directed against an epitope of the rat protein. The antibody can be used in western blot and immunohistochemistry applications. It and has been designed to recognize CaV1.2 from mouse, rat and human samples. The antigen used to immunize guinea pigs is the same as Anti-CaV1.2 (CACNA1C) Antibody (#ACC-003) raised in rabbit. Our line of guinea pig antibodies enables more flexibility with our products such as immuno-colocalization studies, immunoprecipitation, etc. Lee, M.Y. et al. (2017) PLoS ONE 12, e0171262. CaV1.2 (CACNA1C) Channel Overexpressed Membrane Fractions (#LX-104). The CaV1.2 overexpressed membrane fractions enables end users to check the expression of endogenous CaV1.2 as opposed to a tagged version and serves as a positive control for testing the expression of the channel and a quick way to test the antibody. CaV1.2 (CACNA1C) Channel Antibody and Membrane Fractions Kit (#LK-104C). This kit includes the CaV1.2 overexpressed membrane fractions, and Guinea pig Anti-CaV1.2 (CACNA1C) Antibody (#AGP-001).